Intel Atom CE4100 (Codename: Sodaville) is a System-on-Chip (SoC) media processor designed for use in set-top boxes, media player and internet TVs such as D-Link Boxee Box and Sony NSX-24GT1 Google TV. The Atom CE4100 is a 45nm-manufactured SoC running at 1.2 GHz. The Atom CE4100 supports hardware decode of up to two 1080p video streams (H.264, VC-1, MPEG-4/Divx..) and advanced 3-D graphics. It is also able to handle Adobe Flash 10 and 3D gaming as well. 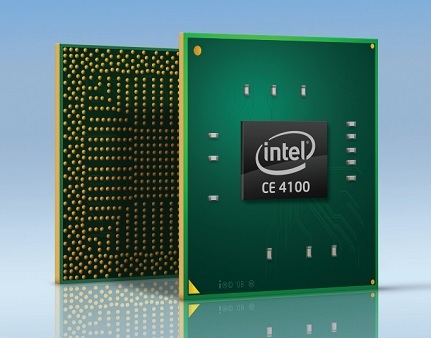 For further details about the processor, please refer to Intel Atom CE4100 Product Brief. The Atom CE4100 custom linux kernel and SDK are not publicly available, and you’ll need to contact an Intel FAE if you want to develop on the platform. However, some development tools for Atom (i.e The Intel(R) Embedded Software Development Tool Suite for Intel(R) Atom(TM) Processor) including a C++ compiler (GCC compatible), performance primitives (﻿﻿optimized multimedia functions), performance analyzer, application debugger ans JTAG Debugger that have been validated against the CE Linux build can be downloaded at http://www.intel.com/software/products/atomtools. You can download the evaluation for free (valid 30-days), but you’ll need to purchase the tools if you wish to use them more than 30 days. For an overview of the tools, you can download Intel Embedded Toolsfor Atom Processor Product Brief. They also have a section for free non-commercial software development where you can download Intel Software Development Tools such as Intel® Parallel Studio XE 2011 for Linux or Intel® C++ Studio XE 2011 for Linux. You can also refer to Intel Atom Embedded Tools Online Documentation if needed. Currently, Google TV – that now runs on Intel Atom CE4100 – is closed source, but Google intends to release Google TV source code in 2011. Both are out of stock at this time. However, that should not be a problem since you can order a Logitech Revue Companion Box with Google TV (if you did not get a free Google TV device from Google) at a much cheaper price than the development kits above. nice to meet you. I would like to know how to get atom Ce4100. shoud I buy Connected A/V or should I buy Blue ray disc player. is this only one way to get Atom ce 4100? I would like to know that. For Videon-central connected A/V or Blue ray disc player development kits, it depends on what you’d like to do, you’d better contact Videon-central directly. You could also buy a products such as Logitech Revue Companion Box. However, If you need to do some serious development (e.g. make your own hardware or perform kernel modifications), then you’d have to contact your Intel distributor or FAE. I’ve just come across a Beijing company that manufactures Intel Atom CE4150 development boards. See http://www.logicgrass.com/ce4100.html for details (in Chinese).